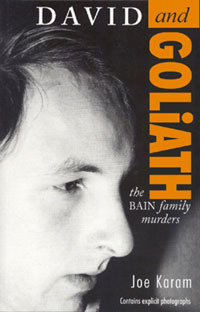 The Bain family murders is a high profile case in New Zealand. A mother, father and 3 siblings shot to death in the early hours of a Monday morning. Only one member of the family survived, a young man who is currently serving a life sentence for the 5 murders. Debate has raged ever since on the guilt or innocence of David Bain. Was David out on his paper run when the murders occurred, did he return to find his entire family dead or did he plan an alibi by committing the brutal murders and then continuing to deliver papers as normal? Joe Karam presents his argument in 'David and Goliath'. The title gives an indication of the books contents. David Bain against much bigger adversaries being the police and the Crown. Karam examines the evidence in the case against David. He suggests alternative scenarios to the facts presented by the Crown. He also looks at the evidence of the secret witness that never got to testify and the behaviour of the police involved in the investigation. Karam argues it was a murder/suicide with the father as the culprit. He puts forward a motive and supporting evidence for this theory. For those who followed the case it offers an interesting angle. For those with only a recollection of a multiple slaying somewhere in the South Island, it may just make you want to learn more. There is no doubt that Karam believes in David Bain's innocence. However is his argument convincing? I'll leave that up to you to decide.